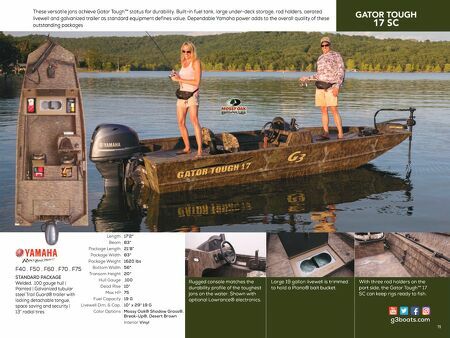 The Gator Tough™ 17' Center Console provides a superior choice for the angler without boundaries; right-sized for river or lake, the new hull design, with 10 degree deadrise and shallow V entry line, creates a quick time to plane and a smooth, fuel-efficient ride. It all adds up to more performance, with less horsepower. 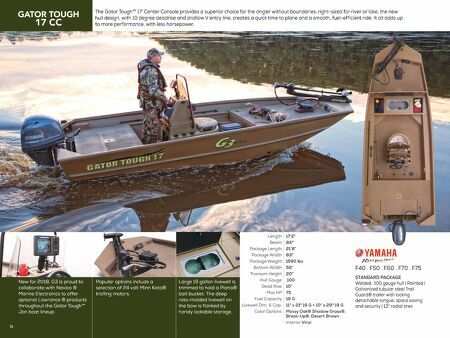 STANDARD PACKAGE Welded, .100 gauge hull | Painted | Galvanized tubular steel Trail Guard® trailer with locking detachable tongue, space saving and security | 13" radial tires New for 2018, G3 is proud to collaborate with Navico ® Marine Electronics to offer optional Lowrance ® products throughout the Gator Tough™ Jon boat lineup. F40 . F50 . F60 . F70 . F75 17'2" 83" 21'8" 83" 1590 lbs 56" 20" .100 10° 75 19 G 11" x 21" 16 G + 10" x 29" 19 G Mossy Oak® Shadow Grass®, Break-Up®, Desert Brown Interior Vinyl Length Beam Package Length Package Width Package Weight Bottom Width Transom Height Hull Gauge Dead Rise Max HP Fuel Capacity Livewell Dim. & Cap. Color Options 78 Large 19 gallon livewell is trimmed to hold a Plano® bait bucket. The deep roto-molded livewell on the bow is flanked by handy lockable storage. Popular options include a selection of 24 volt Minn Kota® trolling motors.